It is great honor that BEVS is invited to make a presentation of Intelligent R&D, Testing and Inspection at Business Solutions Hub during MECS 2018, Dubai. 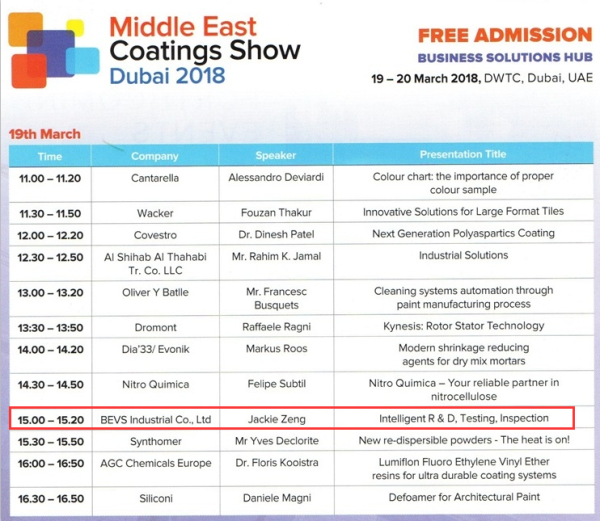 This is the very first time that a Chinese company shows on this occasion to share the cutting edge info of the paint and coatings industry. It is a trend that more and more industries will get into robotic production. For lab, robotic system is of great help to decrease cost, error and etc. BEVS robotic system is the one with those featured specialties on the R&D, testing and inspection. Mr. Zeng made a full introduction and gained claps on site.